More on wot I'm reading! 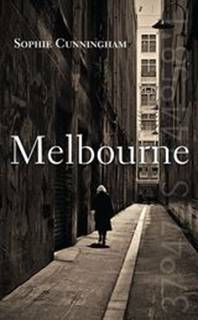 For the last few days I've been happily immersed in Sophie Cunningham's beautiful Melbourne, which is part history, part travel guide, part memoir. It's been particularly eerie to read because, although we have never met, to some extent our lives seem to have followed parallel tracks, though Sophie is much cleverer and more confident than me and slightly older. For instance, I realised that at the exact same time she was working at McPhee Gribble and also living in Cecil St, where the publishers were based, I was an impoverished student living in the much noisier and less picturesque Alexandra Parade, where my bedroom looked out over Cecil St, directly onto the McPhee Gribble building. Did I ever see her come and go? Did she ever look up and see us, drinking beer on the roof? Probably. Later, she ventures south of the river to St Kilda East for a couple of years, and Wall 280 is her local cafe. Snap, though I may have been there a little earlier. Names of people I know crop up throughout. An author I went to uni with, my current editor, a woman who was once my House Captain at school. And of course, I know most of the places - the bookshops, the bike paths, the parks, the pubs, the footy grounds. It makes for a slightly spooky reading experience. Or perhaps that's just Melbourne. PS And now I see that my good and gifted friend Christine, a frequent visitor to that house in Alexandra Pde, is splashed all over the back page of today's Age. Sigh. We really do belong here. This made me laugh -Melbourne is a SMALL TOWN. And what's more, Sophie and Kate, I can almost guarantee you would have brushed sleeves at A&U Christmas parties (oh yore - sigh). My friend Bridget went to John Gardner High and her brother Xander was in Sophie's year. Lots of names that I associate with their family crop up in the book. Of course had we grown up in Broady, left high school in year 10 and only ventured into the city to go up King St on a Saturday night we wouldn't feel quite the same way. That's so true, Sandra -- but still, a la The Slap, it's MY Melbourne, and I'm going to enjoy it! I admire you. You were my inspiration to become a writer. Your writing is inspirational and beautiful, I am in love with so many of your books, 'Winter of Grace,' was astounding, and'the Singer of All songs' breath taking, read it in 2days flat, i couldnt put it down. I hope that you read this, because getting a comment back from you would mean the world to me. You are my hero, and i can only aspire to be even half as brilliant as you are. Thank you, your books saved me in so many ways, i have had a hard time lately and being consumed in your books brings me out of my situation, even if just for a while. Please respond. Thank you so much for your lovely comment. I'm so very pleased that you've enjoyed my books and that they've helped you in a difficult time. I hope things are better for you now. I'm especially glad that you liked Winter of Grace, because not so many people have read that one! Good luck with your own writing, let me know how you get on. thank you so much for responding to my comment, it means a lot to me, things are still a little rocky, but i have been better. But i want to know, how did you become a writer? What was the process like? Sorry it's taken a while to get back to you. I hope things are still improving for you. To answer your question, I feel as if I was always a writer - I was one of those kids who was always scribbling stories. then when I got older I started sending off short stories to magazines and got a few published and won a couple of prizes. This brought me an agent and then I started working on longer manuscripts, and it all flowed from there.